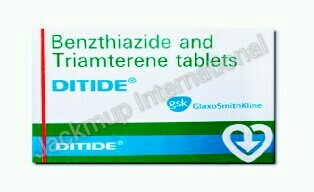 Description:- Benzthiazide is used in fluid retention (edema), heart failure, increased blood pressure and kidney stone. Benzthiazide lowers the blood pressure and swelling by removing extra water and electrolytes from the body. Triamterene is used in the treatment of increased blood pressure , heart failure, cirrhosis and low potassium. Triamterene lowers the swelling by removing the levels of excess water and electrolytes in the body. Triamterene does this without loss of potassium from the body. Consult a doctor before taking benzthiazide if you have diabetes, gout (pain and swelling of the small joints), liver, kidneys or pancreas disorder. You will be regularly monitored for blood electrolytes in case if you are an elderly patient or have kidney problem or during treatment with certain pain killers while taking benzthiazide. Avoid direct sun exposure during the treatment of benzthiazide, as it may cause sensitivity to light (photosensitive) and may lead to the development of rashes on the skin.Seek immediate medical attention if you experience sudden wheeziness, difficulty in breathing, swelling of the eyelids, face or lips, rash or itching. Do not drive or use any machinery after taking benzthiazide as it may cause dizziness. Tell your doctor if you are pregnant, planning to become pregnant or are breastfeeding. Do not take if allergic to benzthiazide or any of its ingredients. Do not take if suffering from serious liver or kidney disorder, high levels of potassium or calcium in blood. Do not take if suufering from a disease of the adrenal glands causing weakness, weight loss and a deficiency of hormones in the blood (Addison’s disease). Do not take if suffering from diabetic ketoacidosis (high concentrations of ketone bodies).